It seems like every week there is a new scandal, a new shock coming from the White House! That was the least hostile thing said. It was said for all the wrong reasons, not the right ones! Since January, an even more serious situation has developed in the US. 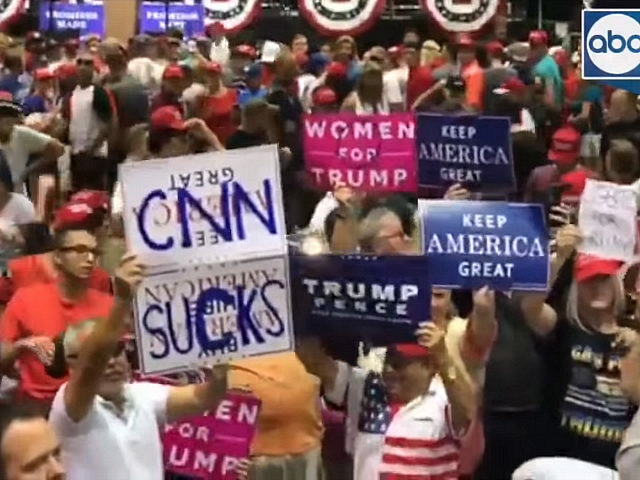 That situation is exemplified by the scene of thousands of frenzied Trump supporters cursing at and giving the finger to a CNN reporter at a Trump rally. Mixed in with the curses were cries of “go home” and “tell the truth”. Translated, that means that they don’t want anything reported that might show them and their hero for what they really are. This is the result of Trump’s unrelenting, daily attack on the media as being “enemies of the people” and “fake news”. Socialists have no illusions in the capitalist media and in the capitalist (“bourgeois”) democracy that the media is based on. But replacing it with a frenzied, right wing racist mob and direct one-man rule is a huge step backwards, not forward. It is not just the base; his relationship with his own class is also vitally important. 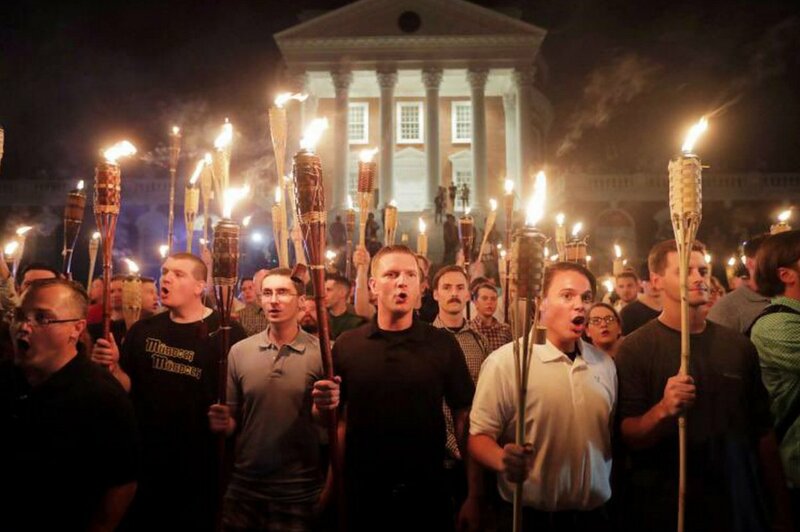 Fascists marching in Charlotesville, VA.
Trump said there are “good people” among these racists. corporations, major sectors of the capitalist class were beginning to come around. This was despite the way in which he was destabilizing things by, for his example, his partial support for the fascists in Charlottesville. Several developments have really alienated most of his class, though. First is his initiating of a tariff war. This really threatens the world economy. Second was his attacks on NATO at the recent conference in Europe. 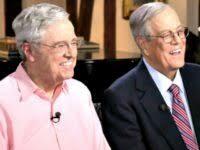 The recent proposed budget, with the largest deficit in US history, was too much for even the Koch brothers. These right wing ideologues have now actually abandoned the Republican Party! When a national leader bases him or herself on such a frenzied mob and when they are alienating much of the capitalist class, this tends to drive them towards direct one-person rule. And that is where Trump is headed. Even these extreme right wing capitalists have turned against Trump and the Republicans, due to Trump’s tariffs. In most presidencies, the administration is made up of representatives of the various factions in that president’s party. In that way, the different strategies and the limited differences in interests of different wings of the capitalist class can have influence. Trump has eliminated that; anybody wanting to serve Trump has to be a complete yes-man or woman. Through his control of the Republican Party base, Trump’s control over the Republican Party is near-complete. Cross him, and any Republican politician is liable to be voted out in the next primary they face. With the Republican majority in both houses of Congress, Trump is now able to control congress. 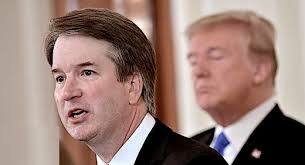 Trump with his nominee for Supreme Court, Brett Kananaugh. He thinks the president is above the law. The capitalist class as a whole can also control its president through the federal court system. Trump has appointed a whole series of federal district court and appeals court judges. Some of his nominees (such as John Bush and Brett Talley) had left a paper trail of open racism so their nominations had to be withdrawn. But that simply shows the types that Trump has nominated. With his nomination of Brett Kavanaugh for the US Supreme Court, Trump’s direct control over federal judiciary is near complete. Kavanaugh has written that, in essence, the president stands above the law. Meanwhile, the walls are closing in on Trump with the Mueller investigation. 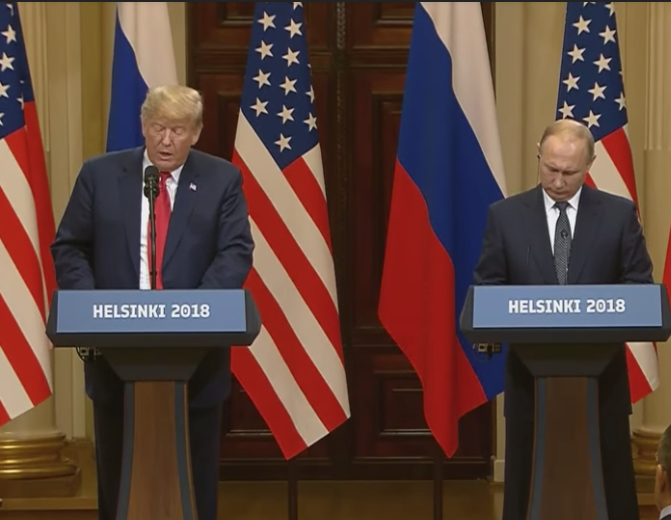 As we have noted over and over, Trump is a long time money launderer for the Russian mafia and he has, in fact, colluded with their representative (Putin) during the elections. He cannot afford to allow the investigation to expose him. How can he prevent this? A little noted event was the confirmation of Brian Benczkowski as the head of the Justice Department’s criminal investigation department. In that position, Benczkowski is directly over the Mueller probe. Who is this man? Benczkowski has no experience whatsoever as a criminal prosecutor. What he does have experience in is as a defense attorney for the subjects of white collar crime cases. That, combined with his work as a former chief of staff for Jeff Sessions when Sessions was a US senator. In particular, in his role as criminal defense lawyer, Benczkowski had been hired by Alfa Bank, one of the largest commercial banks in Russia. What is the relevance? On Oct. 31, 2016, just eight days before the presidential elections, a strange link was reported between computer servers of Alfa and the Trump organization2. Alfa denied any collusion, but interestingly, within days of the report the Trump computer server was shut down. There are some possible explanations of this link, but taken in their totality, it seems highly unlikely that this was not part of the collusion between the Trump campaign and Putin and his cronies. In order to defend itself, Alfa hired an attorney in the United States – none other than Brian Benczkowski! Trump had nominated him back in June of last year, but he wasn’t confirmed until this last June. Under questioning, he promised to recuse himself from any investigation into Alfa Bank, but not into any investigation of Alfa’s parent company. So, Trump now has a direct ear into exactly what information Mueller is getting and what he is planning. Presumably, has his immediate supervisor, Benckowski would also have the power to fire Mueller, and a campaign towards that end is already under way among Republican congress members. That brings us to November’s mid term elections. Trump is setting the stage. At a Montana campaign rally on July 5, Trump commented: “A vote for the Democrats in November is a vote to let MS-13 run wild in our communities…. Democrats want anarchy, they really do, and they don’t know who they’re playing with, folks.” We should take such comments seriously. They are setting the stage for a possible (unofficial) nullification of November’s results, should Trump feel that is necessary. It is far from certain, but we cannot discount the possibility. It could be done through voter suppression on a scale far wider than anything seen in recent years, or through outright fraud such as what happened in the Florida 2000 vote “count” that resulted in George Bush becoming the president, or a combination of both. In the Florida 2000 event, mass protests got started, only to be squelched by the Democrats and their lieutenants, the union leadership. It seems unlikely that they would be able to completely suppress such a movement today. In fact, they might partially encourage it – or at least the “progressive” wing could. How far would Trump go to outright repress them? Would such repression be linked to a possible Benczkowski removal of Mueller? What organized forces could stand in the way? Some might point to the forces that Alexandra Ocasio-Cortez represents. This recent “rock star” of the left defeated a top Democrat in the New York City primary for congressional representative in Washington DC. (The final election will be in November.) What made her victory stunning was that she openly identifies herself as a “democratic socialist” – or at least she did at that time. Ocasio-Cortez playing up to the right wing Margaret Hoover on PBS. However, she is now on the fast track to getting along with the rest of the capitalist Democratic Party. She did a recent interview on PBS, for example. In that interview she walked back her criticisms of the racist State of Israel. Maybe more important was her entire attitude towards the interviewer, Margaret Hoover, who described herself as “center-right”. 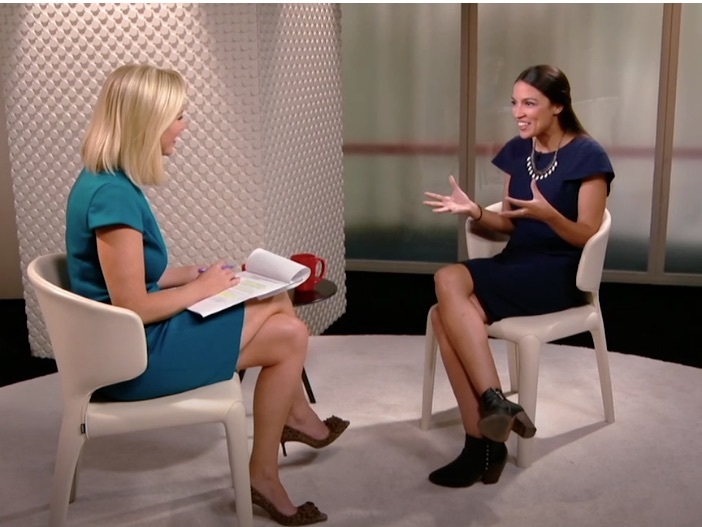 Throughout the interview, Ocasio-Cortez tried to find common ground with this center-rightist. At one point she completely agreed that she’d be “learning” from her fellow Democrats, and maybe some Republicans, when (if) she gets to Washington. Key was her comment that she does not intend to be “antagonistic” to the representatives of big business. In the context of her cozying up to Hoover and her expressed desire to “learn” from these representatives in Washington, this can only mean that she will try to get along with the representatives of the enemy, rather than confront them. There is now a systematic campaign to bring her, and the forces she represents, into the fold. What would happen in the event of a major shock, such as the scenario we paint above? If there were mass street protests, the Democratic Party along with their lieutenants, including the union leadership and the NGO’s, would do all in their power to prevent any mass protests from actually shutting anything down. Most especially, they would oppose trying to get workers to shut down their work places. Given the rapid evolution of Ocasio-Cortez, it seems most likely that she would collaborate in this effort. Again, it would be foolish to definitively predict that something like this will come to pass under Trump. But it would be even more foolish to assume that, just because US capitalism has ruled through capitalist democracy, that such a form of rule must last forever. Trump definitely represents, yes a partial continuation from the past, but also a sharp break. The American bourgeoisie does not want or need fascism. Not now anyway. Especially since there is no mass movement opposing capitalism and compliant trade unions. They will kill him before they allow him to try to establish one man rule. I doubt that 98% of those who follow politics ever thought Trump would get anywhere near the presidency. The fact that he won should cause us to rethink some of our assumptions. Poulantzas made an astute observation when he said that (to paraphrase), fascism arises not so much in response to a strong labor movement. He point out that, in fact, most European fascist regimes rose AFTER large defeats of the working class movements. He stated that a major factor in the rise of fascism is a *deep split within the ruling class*. This is what I think John Reimann is pointing out. Poulantzas’ argued that, at certain historical points the capitalist system’s crisis becomes so severe that the ruling class is deeply split as to how to respond. In such a situation, a Trump-like figure (a strong man) can arise and mobilize a mass base, and based on that mobilization *impose discipline* on the dissenting members of the ruling class, and force his policies on the society at large. So, fascism arises out of a need not only to discipline the working classes, but even more so to discipline the liberal wing of the ruling class. We may have been witnessing the beginning of that disciplining process for the past year and a half, right now here in the U.S. Thank you for your comments, Reza. That is exactly my point. I don’t really see Trumpism as possibly becoming “fascist” in the classical sense. If you take Hitler, for example, he had a mass base and a large private militia. This enabled him to go far further than a typical strong-man type dictator, which I think would be more like what we could see under Trump. But I think classically, such a dictator – bonapartism – arises when the capitalist class is at a dead end and has lost its base and the working class is stymied and cannot step into the vacuum that is created. At such times, a bonapartist dictator can step forward who is partly above and out of control of the ruling class and typically balances between the classes.